1. Using my template cut out all the pieces, lay them down flat and piece them together. 2. Sew on the pocket, shirt, and Jolly Roger. 3. Cut a piece of the cotton flannel for the back of the head. Sew the hat, hair, and shirt onto the head. 4. Cut a piece of the cotton flannel the same width of the shirt for the face. Sew the hat and shirt onto the face. With the zig zag stitch (keep the stitches very close together) sew on the white part of the eye. Sew the x for the missing eye. Hand stitch the button onto the eye. 5. Sew the buckle onto the belt and the boot. Sew the belt onto the front and back of the doll, in-between the shirt and shorts. Attach the boot and peg leg to the pants on the front and back. Make sure they line up properly. 6. Sew on the cheeks, nose, mustache, and the eye patch (sew only the top part of the eye patch so that you can lift it and see the missing eye). With brown thread (or whatever color you use for the hair) hand sew the chest hair. 7. With the wrong sides together sew the hook and stuff it using a chop stick. Sew the stump onto the cotton flannel hand, leaving a 1′ space for the hook. Hand stitch a black anchor on the forearm. Sew the arms and sleeves right sides together. 8. Turn the arms right side out and stuff the batting in tightly (you might want to use the end of a wooden spoon to pack it down). Hand stitch the hook into the black stump. 9. Pin the two sides right side together and sew leaving openings for the arms and the top of the hat. Turn inside out. 10. 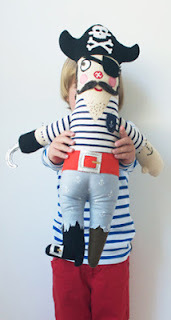 Stuff the pirate doll. Hand stitch the hat closed. Hand stitch the arms into the openings of the body and you’re done!